Designing a brochure is easy when you start with a great template. When you need to rustle up a quick brochure to promote your business, you might think that using a dedicated desktop publishing program such as Adobe InDesign or Microsoft Publisher is the best way to go. But if you're familiar with Microsoft Word, you may have little reason to invest in--and learn how to use--an expensive publishing program to handle this task. Unless you're working with a commercial printer to produce an extremely high-quality print job or a large print run, and the company requires that your file be in a format that Word doesn't support, you can probably get along just fine with Word. You should, however, make a point of asking the vendor that you intend to use which formats it can work with, before you start designing your brochure. Approach your brochure design systematically, and test the results as you go. Designs can look very different on the page from the way they look on a monitor. If possible, create a template containing styles and color schemes that you intend to stick with over the long term. This will make your next brochure project easier to complete; more important, it will establish visual consistency so that your customers will recognize your marketing materials and associate them with your brand. If you didn't go to design school, don't be intimidated; in this article, we'll walk through the basics and take into account the most common pitfalls you might encounter. Word's built-in templates are a good place to start the process of creating a brochure. Even if you don't plan to use much of a template's design, you can harness its layout to set up your own more quickly. The typical business brochure is printed on letter-size paper and folded twice to provide six equal-size panels--three on the front and three on the back. Such a brochure will fit in a standard display case of the type commonly found in business reception areas. You can print this kind of brochure on any business inkjet or laser printer. To browse the available templates, select File, New, Brochures and Booklets, Brochures. (If you're using a Mac, click File, New from Template, and then choose Brochures from the Publishing Layout View.) Look for a design that uses the size of paper and the number of folds that you prefer--typically, letter-size paper and two folds. If the design looks great, that's a bonus at this stage. Click Download to save the template to your hard drive. Locate a brochure template that matches your paper size and has the desired number of folds. You'll want your brochure to print in such a way that your cover content appears inside the panels and doesn't straddle the fold lines. The cover content should also be centered nicely to avoid looking imbalanced. To ensure that the template is properly laid out, print a copy on the same printer that you intend to use later. Fold the brochure and confirm that everything lines up neatly. If you notice that something is not correctly positioned, go back to the template document, move the improperly situated text box or image, and print another copy. Persevere until the basic layout meets your approval. Now you're ready to start replacing the template's dummy text with your own content. To replace any of the brochure's existing text with your own, select a block of template text in a text box and press Delete. Then type your own text into the text box, or copy and paste it from another document. Text boxes in Word will retain their size and placement even if they are empty, so replacing the template text should be fairly easy. If you're adjusting the size of a text box, avoid widening it as that may push the text over a fold later on. In most cases you can adjust the height and vertical placement of a text box without causing problems. Also, you can replace a text box with an image that you've scaled or cropped to match the box's dimensions; and conversely, you can replace an image with a text box. Print the template on your target printer to confirm that it prints and folds correctly. Word lacks the precise kerning and line-height tools that dedicated desktop publishing programs offer, but if you start with an attractive template, brochure elements such as your headings should end up looking the the way they do in the template. Before replacing anything in the template, check to see whether the document is in 'compatibility mode--meaning that you've opened a file created with Word 2007 or an earlier version of the program (it will have a .doc file extension instead of .docx). Another way to determine whether the document is in compatibility mode is to scan the Word title bar: If that's the document's mode, the file name will appear there with the notation "[Compatibility Mode]." Because this older format doesn't support all of the features of the latest version of Word, you should convert the file so that you can use all of Word 2010's features. To do so, select File, Info, Convert, and then click OK. 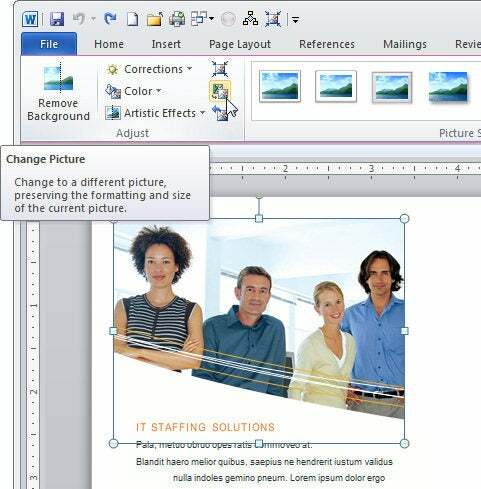 The new Word 2010 document format lets you change pictures in a document by using the Change Picture tool. To replace one image with another, first click the image that you want to change. Go to Picture Tools, Format on the ribbon toolbar, find the 'Adjust' group of options, and click Change Picture. Next, select a replacement image and click Insert to swap it in and the existing image out. Word will automatically resize the new image to fit the available space, as long as the orientation is the same--for example, if you're replacing one landscape image with another one. If you replace a landscape image with a portrait image, or vice versa, you should resize the new image or reposition it to take into account the change in orientation. After inserting the image, you can move it or crop it (with the Crop tool on the Picture Tools, Format tab of the ribbon toolbar).